God’s Great expectations of Youth Pastors. This verse can sometimes serve as a direct punch to the gut. 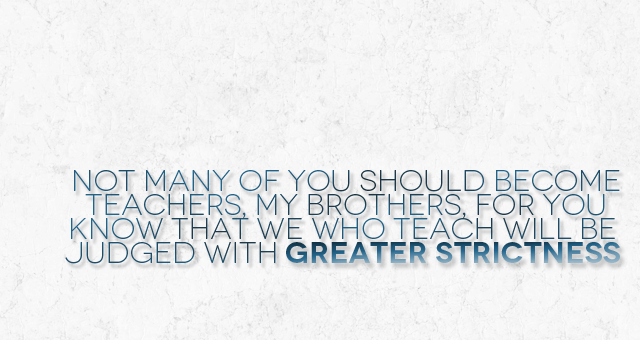 The easy way to see this verse is that its talking to those who want to be Teachers but are not called. In Youth Ministry application, it could be seen as talking to people who want to be Youth Pastors yet are not called to be Youth Pastors. It’s sometimes tough to imagine that people would be crazy enough to want to be Youth Pastors without being called to be Youth Pastors by God, but their are people out there living this way. But like I said, thats the easy way to view this verse. What God has been laying on my heart as I reflect on this verse is the idea that as Youth Pastors, we are teachers, and we have HUGE expectations on us. Not just the expectations the Parents of the teens we minister to, not just the expectations of the teens we minister to. Greater than the expectations our Sr. Pastors and Elders and other church members have on us as the Pastor of the Youth. God called you to where you are. I don’t know your current circumstances in ministry, but I look back at where I was a year ago, and even in that dark time, I understand that God called me to that church and that ministry. Just because I am no longer there, doesn’t mean I wasn’t supposed to go there for a season. And the same applies to you. Whether you are in a dark time in your Ministry or things have never been better, God has placed a Call on you, not just to Youth Ministry, but to the specific Ministry you are in right now. This means that God has great expectations on you, on me, on every one of us who have accepted the call as Youth Pastors. God has been laying on my heart the severity of this the last few months and weeks and really pushed me hard about something I have been struggling with the last year or so. Im of the understanding that as Youth Pastors, one of our functions is to Teach the Bible to the students. Yet, in the past, I have taken something that God takes very seriously, and James tells us we will be held accountable for, and placed it in the hands of people I have never met. There are great curriculums out there, there are great resources available to us as Youth Pastors to make our “jobs” easier. And in the past, I have been a huge fan of these things. But I have to wonder, did God really call us to the Ministries he has called us to so that we could teach the students what some other Youth Pastor is teaching their students and repackaging for us to buy for $20?